We’ve explored the use of icons in mobile games before from a design perspective. Game UIs are an extremely important aspect of game functionality, and need to maximise options and information for users without distracting from the content of the actual game. With new games constantly hitting the market, there’s more and more solutions to this problem emerging. Icons are a simple, straightforward way of making game UIs work properly, and there’s no shortage of inspiration out there. Desi Quintans of Envato argues that “The role of a good UI is to provide relevant information clearly and quickly, and to get out of the way once it has done its job.” Let’s look at two very different mobile games which achieve this by using icons in markedly different ways. 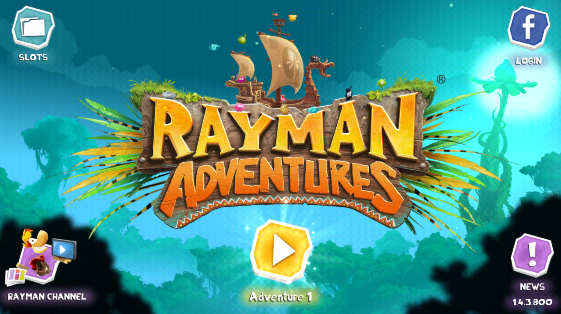 This is the new instalment of the popular Rayman series, Rayman Adventures. For those of you who don’t remember Rayman, it was a popular platform game starring Rayman, a guy with no arms, legs, or neck. I always liked the Rayman series for its unique aesthetic: they’re always very vivid and visually imaginative games, with handpainted backgrounds and striking, colourful characters throughout. With colour being really important to the look and feel of a product, Rayman has always got it right in this department. 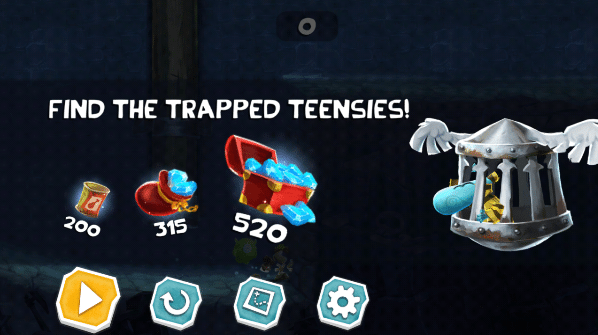 This instalment of the Rayman series is unique in a number of ways. It moves past the traditional WSAD, button-mashing control scheme of the original series by forcing users to rely on swipes. This combination of rhythmic swiping as Rayman moves across a more conventional platforming map is pretty innovative, and really adapts the series to smartphone users’ needs. They’ve also kept all the colour and simplicity of the original series throughout the game’s overlay UI and menu UI. Menu items and HUD overlay are minimal here; the game instead relies on prompts from in-game characters and slow-mo to give players hints, before disappearing off-screen again. What there is in the way of GUI uses mostly icons—and they’re pretty good ones too. They’re simple, almost flat, and the use of white on black colour makes them eyecatching. To keep things lively, lots of animated background characters also dance across certain menu items (like the game’s logo). This allows the menu to present the game as a lively and fun experience for casual users. 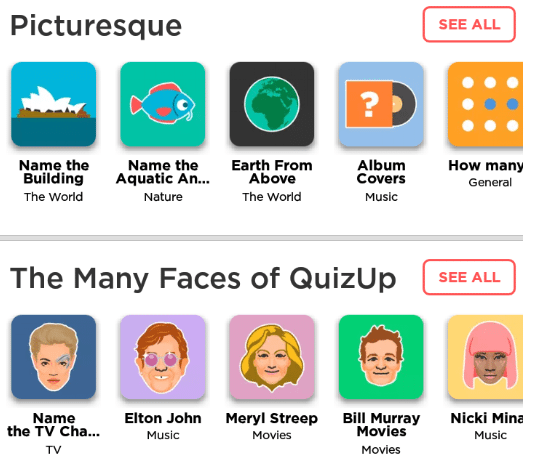 So addictive that it almost derailed the writing of this post, QuizUp is a multiplayer quiz game designed by Icelandic devs, Plain Vanilla Games. The mechanics are pretty straightforward: players choose a topic, they’re thrown into a lobby with another player interested in the same topic, and the two of them must battle it out by answering pointless trivia. What makes the game interesting from a design perspective is that the designers have contended pretty well with the issue of bulk. A multiplayer trivia game like this naturally requires thousands of questions, topics, and player data, and you can see that they had a hard time fitting all of it in. What does work particularly well is the app’s use of icons. 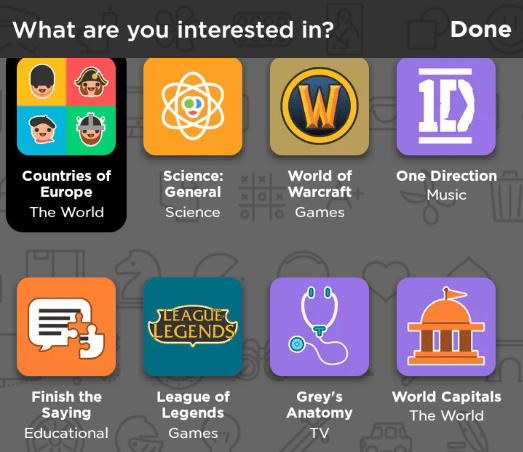 When you’re choosing topics or subjects, for example, each one is represented by a unique icon. Not all of these are great, but it gives the game a sort of Google Play store feel, and makes it easy to navigate between different topics. The icons are colourful, easily recognisable representations of each topic. It’s a great example of how you can use icons within an app interface to condense a lot of information and user options in order to produce a great final product.